New Brunswick, New Jersey Personal Injury, Product Liability, Workers Compensation Attorney | John VR. Strong, Jr.
With over 40 years of experience as an attorney, John VR. Strong, Jr., who is certified by the New Jersey Supreme Court as a civil trial lawyer, has the knowledge and skills to handle even the most complex legal issues. Testimony to his integrity and excellent legal counsel is his BV® Distinguished Peer Review Rated by Martindale-Hubbell® listing for his professionalism and ethics. The Strong Law Firm was established more than 100 years ago. John VR. Strong, Jr. and his law firm have been lauded by clients as responsive, professional and efficient. Our clients depend on our iron-clad name for excellent legal service in Middlesex County, as well as Mercer, Hunterdon, Somerset, and Union Counties. At our firm, you are given full attention, clear and precise advice on your legal options, and strategic and effective solutions to your legal problems. 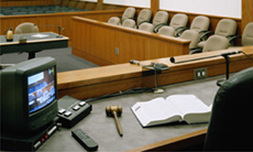 We are committed to creating a detailed plan for your legal matters and resolving your cases favorably. Call John VR. Strong, Jr. at 732-249-0550 or contact the firm online to schedule your free consultation. John VR. Strong, Jr. serves clients in New Brunswick and throughout central New Jersey, including Middlesex, Mercer, Hunterdon, Somerset and Union counties.